Shoveling and other chores: How young is too young? 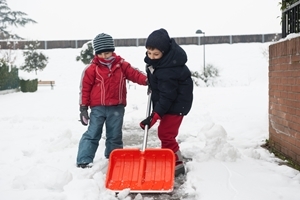 Home » Dad » Shoveling and other chores: How young is too young? In the winter, every approaching snowstorm brings one question to my mind. Just how long until my daughter is ready to help me with the snowblowing and shoveling – not to mention all the other chores around the house? Granted, given that she’s just a month old, I know I’m getting ahead of myself in terms of fatherhood. Right now, the only chore she can handle is not screaming quite so loud during bath time. But even though she’s not really ready for it yet, it’s still interesting to think about. What age is right for which tasks? While every child is different, think about giving chores in terms of a progression. Start with basic “cleaning up”– One of the first things to start off with in terms of chores is the simple concept of your children clean up after themselves. Things like picking up their toys and stuffed animals after they’re done playing with them are simple conceptually – even if they don’t necessarily “want” to do them. Ask them to help you with it, rather than independently. In addition to it actually being a useful task, I look forward to the father and daughter bonding. Ease back on supervision – As children grow, maintain the same chores, but dial back on your role in them. This helps kids continue to become more independent and self-reliant. Plus, it might actually give you some free time for 5 seconds. Start tailoring new chores based on interests – Once your child gets to age 6 or 7, you can begin to tailor new chores to their interests. If they enjoy the kitchen, start them peeling vegetables with kid-safe tools. Other ideas include watering household plants, feeding and walking pets, laundry, and yes, even shoveling. Looking for a more in-depth list? The Flanders Family from Texas made this simple printable chart. In terms of execution, it’s also important to take a step back and remember that whatever your children actually do – whether that’s making their bed, folding laundry, or anything else – it’s not going to be perfect. As a father, you need to resist the urge to over-correct everything, and focus on the concept of a chore completed. Of course, whenever you start talking about chores, you also need to make a personal decision on how you’re going to handle the idea of an allowance – But that’s a discussion for another day. What do you think? What chores do you start your children out with?